More on the LumiSource Spyra Bar Table with Color Changing LED Lights (Clear Acrylic) BT-SPYRA below. 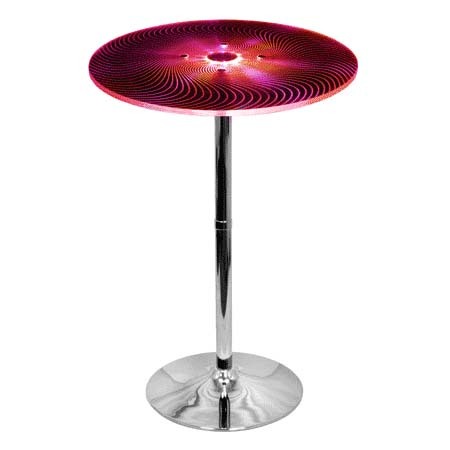 The Spyra Glowing Bar Table adds a colorful twist to your party, featuring etched swirls in the acrylic top that color-phase. Multi-colored LEDs hidden in the table phases between red, blue and green, giving the table its glowing edges. 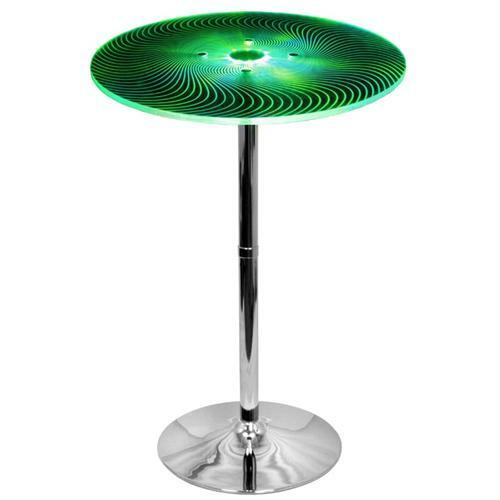 Table is clear acrylic with visible swirled etching when turned off or in the daylight. Includes adapter that plugs into base. Chrome base and pole. Clear acrylic with visible swirled etching in the daylight or when turned off. Attractive even with the colorful LED lights turned off. The table top and edges both glow for a fantastic look! The multi-colored LEDs are hidden within the bar table. Once turned on, it will start to phase between red, blue and green. 4 different speed choices: slow, medium, fast, and hold. Two modes: Standard mode with a power cord that plugs from the wall into the base, and Cordless mode with a battery that lasts up to 6 hours. See related products below for the matching Spyra Bar Stool. Click Here to View An Instructional Video About the Spyra Bar Table and Bar Stool.